The U. S. government commissioned studies to support the listing of polar bears as a threatened or endangered species. Polar bear numbers are currently high and the population has been increasing rapidly in recent decades. Everyone likes polar bears, so this is good news. A decision to list would require forecasts that the current upward population trend will reverse. The government studies concluded that polar bear populations would decrease substantially. Decision makers and the public should expect people who make forecasts to be familiar with the scientific principles of forecasting just as a patient expects his physician to be familiar with the procedures dictated by medical science. Three scientists, J. Scott Armstrong of the University of Pennsylvania, Kesten Green of the University of South Australia, and Willie Soon of The Harvard-Smithsonian Center for Astrophysics, audited the government studies to assess whether they were consistent with forecasting principles. Their paper, “Polar Bear Population Forecasts: A Public-Policy Forecasting Audit,” has been accepted for publication in the management science journal Interfaces. It is the only peer-reviewed paper on polar bear population forecasting that has been accepted for publication in an academic journal. They concluded that the government forecasts were based on false assumptions and their polar bear population forecasts contravened many principles for scientific forecasting. Indeed, the reports followed fewer than one-sixth of the relevant principles. Given the importance of the forecasts, all principles should be properly applied. In short, the government reports do not provide relevant information for this decision. Research shows that for issues such as the population of polar bears—situations that are complex and where there is much uncertainty—the best forecast is that things will follow a “random walk;” in effect, this model states that the most recent value is the best forecast for all periods in the future. Because the polar bear population has been increasing over recent decades, however, a continuation of that trend over the short term is possible. Copies of Armstrong, Green and Soon’s forthcoming paper are available at http://publicpolicyforecasting.com. Validation of forecasting methods is a key issue in climate change because, although we know that climate varies, we have been unable to locate a single scientific forecast that supports global warming. If Mr. Gore or anyone else is aware of such a forecast, they should reveal the source to the scientific community. Claims that science supports global warming forecasts have, to date, failed to provide sources. 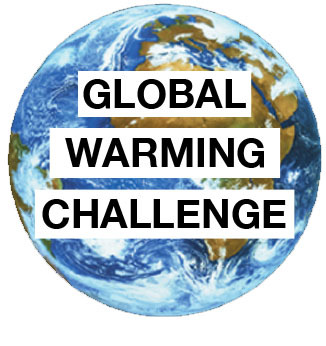 A history of the Global Warning Challenge is provided at http://theclimatebet.com. It includes all correspondence between Scott Armstrong and Al Gore. The site will post all papers that purport to provide scientific forecasts of global warming. The papers must provide full disclosure on how the forecasts were made, as full disclosure is one of the basic principles of science. The extended deadline for the Global Warming Challenge has passed and, despite the fact that I have responded to all of your concerns to date regarding the challenge, you have not been willing to engage in a scientific test of your forecasts of dangerous global warming. Despite our literature searches and our appeals both on the Internet and in our published paper on climate change, my colleague and I have been unable to find a single scientific forecast to support global warming. If you are aware of such a study, I appeal to you directly to reveal it to the scientific community so that it can be subject to peer review and so the public can see the scientific basis for your claims. I look forward to your responses. By your own words, the global warming issue remains an important one for the future of the world. Given the enormous expenditures on this issue, I hope that as a concerned and influential citizen, you will take an active role in encouraging the application of science to this issue. 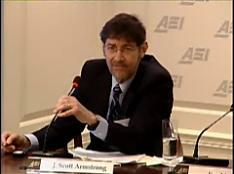 Armstrong’s AEI talk titled Strengths and Weaknesses of Climate Models on Tuesday, February 26th, 2008 is available at the American Enterprise Institute for Public Policy Research website in both audio and video format. Other attendees included: Daniel Botkin, a research professor in the Department of Ecology, Evolution and Marine Biology at the University of California, Santa Barbara; Orrin Pilkey, the James B. Duke Professor Emeritus of Geology at Duke University; Jim Manzi, CEO of Applied Predictive Technologies; Stephen F. Hayward, AEI’s F. K. Weyerhaeuser Fellow; and Kenneth P. Green, a resident scholar at AEI. Anthony Watts introduced to the audience his work on documenting the inconsistencies of surface stations across the United States and the world – the same surface stations that measure local temperature. A wide variety of issues plague these surface stations, from the changing of paint used to coat the outside, to surface stations being placed on roofs, near sewage treatment plants, next to cars and air conditioners. Only 12% of these surface stations recorded so far have been placed in areas that meet all the guidelines. With nearly half of all the surface stations already documented and listed on the site surfacestations.org, the data from Watts’ work certainly puts the very measurement method under question. Tanton began this track with an overview of the history and warning of the future of California, and the implication its policies have on the rest of the United States. The state has implemented a wide variety of policies, from the Pavley Bill setting emissions standards and MPG requirements, to low carbon fuel standards, all of which force a burden on consumers and the economy. The push for less carbon in fuel means at least 5 million gallons of “something else” – undoubtedly the inefficient production of biofuel. Estimates of California’s climate policy reveals that Assembly Bill 32 will be a $512 billion hit to the economy. All of this despite California having the 8th lowest per capita gasoline consumption across the fifty states. Roy Innis, civil rights leader, and Anne McElhinney gave passionate pleas for the economic civil rights that global warming policies too often ignore. The media monopoly combined with the “American people who want to do the right thing” have cloaked the debate over global warming as a moral one. Innis pointed to our three presidential candidate nominees and said “Barack wants change, but not this kind of change.” He recognized that the implementation of global warming policies weighs down disproportionately on the poor of America, shown by the doubling of corn prices due to biofuel in recent years, as well as the poor of the world. Both Innis and Anne pointed to the “green lunacy” of the 1970s that caused the DDT ban, and this particular effect on sub-Saharan Africa: 60 million preventable malaria deaths since the ban in 1972. Since then, in 2006 the World Health Organization completely reversed its prior view of the pesticide, saying it is okay to use the pesticide even for indoor spraying. It has also been shown that bald eagle populations were seriously affected by hunting and human encroachment of territory, rather than DDT. Soon sought to cut through the complex science by titling his presentation “Global Warming 101.” He began speaking of the popular carbon dioxide claims by the IPCC, the same carbon dioxide (hockey-stick) theory by Al Gore that can be shown to be false. He, like many others during the conference, emphasized that carbon dioxide is instead a lag variable in the transitional period from a period of cooler temperatures to warmer temperatures. In place of carbon dioxide, Soon’s research shows that the sun is most likely the dominant driver of recorded Arctic air temperature changes – with an effect factor of at least 10 times that of carbon dioxide. In closing, Soon explained in a humorous metaphor: himself as CO2, William “Refrigerator” Perry as the sun, and Tom Brady as the climate, that CO2 (Dr. Soon) would have little effect on the climate. Following the conference, Willie Soon was featured along with Bob Carter on the Glenn Beck show. It is available to watch below from YouTube. Howard Hayden’s talk began with an analysis of global warming models, saying that the simulations are based on curve-fitting and not on basic physics, or “garbage-in, gospel-out.” Take a closer look at the famous CO2 slide presented by Al Gore and listen to his words, “you can see how well they fit together,” and “there is one relationship that is more powerful than all the others, and it is this: when there is more carbon dioxide, the temperature gets warmer.” Hayden points to the old adage and fundamental scientific principle: “correlation is not causation.” Further, humans are only responsible for 3.5% of CO2 emissions, and the biggest source is actually warm water. Astronomical effects can then be examined for warming or cooling the oceans and its relationship with CO2 emissions. Loehle began his talk by critiquing the method of temperature reconstruction through tree rings. Given the wide variety of issues not limited to: individual trees not responding to temperature, precipitation and species growth limits, Loehle set out on his global proxy study. Using 18 data sets each 2000 years long (sea sediments, cave stalagmites, pollen, ice, etc. ), a corrected global temperature was constructed. This reconstruction under 95% confidence intervals fits with a 1500 year cycle proposed by Singer & Avery that implies the recent warming is merely part of a natural trend. Avery started off the morning with a talk of the ecologically dangerous side of biofuels. The price of energy independence in recent years has caused the price of corn, wheat, and related goods to drastically increase at the cost of good land. In Avery’s words, biofuel “takes too much land and gives too little fuel,” and should lead us to wonder if the land saved by Norman Borlaug was really meant to be used for biofuel. The talk concluded with dispelling some common misconceptions: no species have been lost to global warming yet, and the temperature correlation is with sun spots, not carbon dioxide. Singer began the talk with several questions. If global warming is natural, then why do models predict major global warming? How effective is mitigation? Some opponents say there’s “something wrong with the data” when greenhouse models estimate the man-made effect as much smaller. He then turned the focus to several energy sources and policies that are simply not efficient: wind/solar/ocean energy sources that very expensive, cap & trade, carbon capture. If the United States was truly on a road to energy independence, why not focus on obtaining energy available right on our own soil and off our shores? Armstrong’s talk covered his recent public policy forecasting audit of polar bear populations. The US government’s decision to list polar bears as endangered species comes down to forecasts of polar bear populations, yet none of the authors of the Amstrup and Hunter papers called upon the well-established principles of the forecasting field. The forecast of a 2/3 decline in the polar bear population from Amstrup et al. was instead based on the “unaided expert judgments by a single expert” – the lead author. These forecasts were made despite the fact polar bear populations have been growing rapidly in recent years, and the forecast of increasing ice-free days was projected from only the last several years. The reports involved a complex set of assumptions that make it very difficult to forecast effectively let alone accurately into the future. 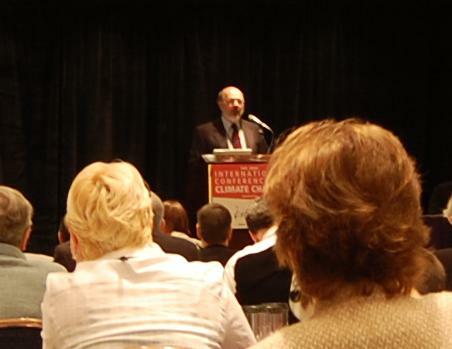 Hundreds of respected scientists from fields as diverse as economics to the physical sciences attended the 2008 International Conference on Climate Change, sponsored by The Heartland Institute. Held at the Marriott Marquis in Times Square March 2nd though March 4th, 2008, climate change skeptics presented their research through different tracks available to talk attendees, including: paleoclimatology, climatology, climate change impacts, climate change economics, and climate change politics. These global warming skeptics offered up their scientific responses to the climate change evidence and predictions from the likes of Al Gore’s Inconvenient Truth. Notable speakers included Lord Christopher Monckton, former adviser to PM Margaret Thatcher, and ABC’s 20/20 correspondent John Stossel. 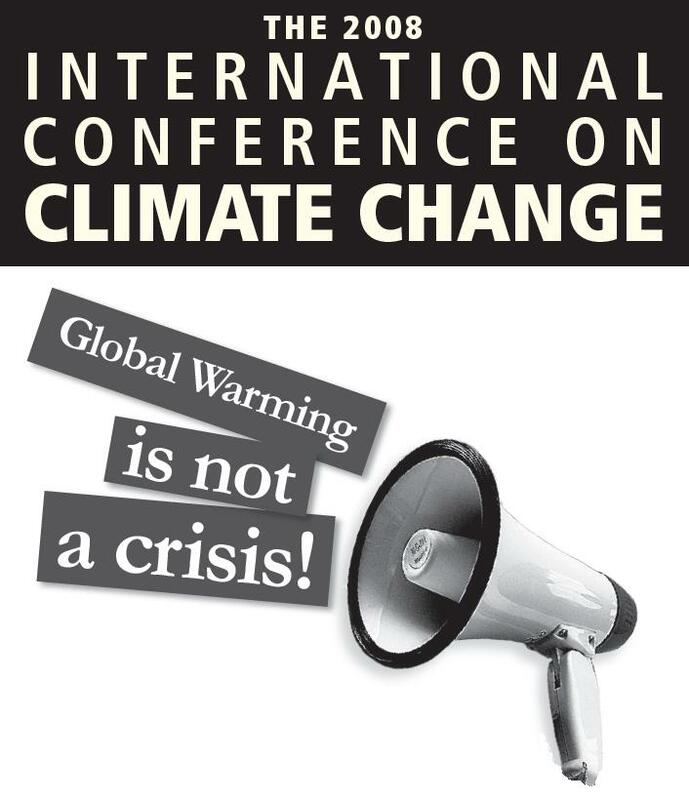 As a website created to promote dialogue and thought about both the science behind global warming and the implication of policies, theclimatebet.com reports on several of the talks and panels for our readers. Mark speaks with Professor Scott Armstrong of the Wharton School of Business at the Univ. of Pennsyvania, also associated with the Heartland Institute. Professor Armstrong is internationally known for his pioneering work on forecasting methods. Recently, he has put forth a scientific challenge to former Vice-President Al Gore regarding Global Climate Modeling. Why did he propose this global warming challenge to Al Gore? Professor Armstrong explains his reasoning behind his challenge. Mark takes call on the subject as well.